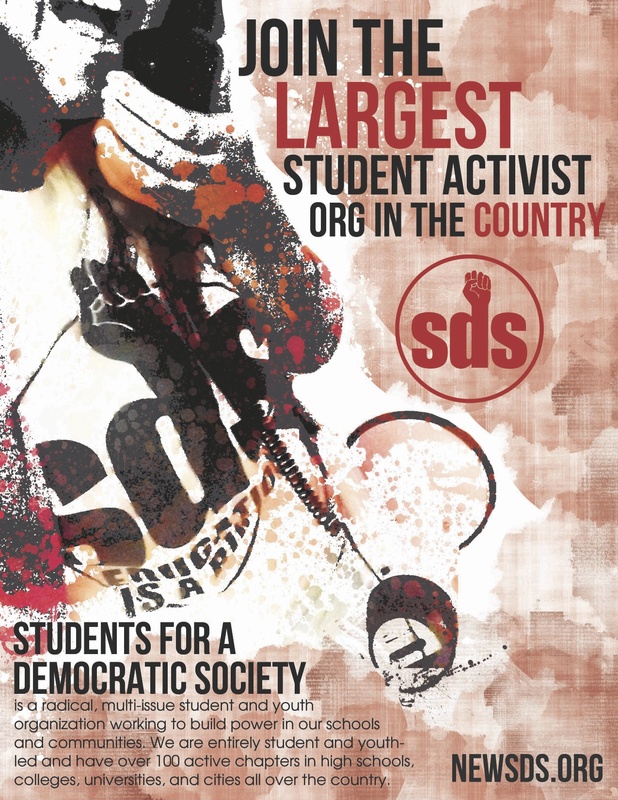 UMN SDS – Solidarity w/ Whose Diversity? – Drop the Charges NOW! Students for a Democratic Society UMN stands in solidarity with Whose Diversity and those activists arrested in the righteous act of civil disobedience in President Kaler’s office on Monday. We call upon the university to immediately drop all charges against students! As Minnesota’s flagship state education facility, the University of Minnesota does not serve all Minnesota students but rather privileges some while systematically and institutionally burdening others. Rather than being a strength and pillar of the community, offering young people upward mobility, it has maintained the status quo of privilege to benefit a few at the expense of many others. While the population of Minneapolis is 18.6% African American while the U has only 4.1%. The Latino community of Minneapolis is 10.5% whereas the U has only 2.6%. Many more indigenous American Indian Minnesotans and immigrant populations like Somalis and Hmong are also greatly underrepresented. Many of these populations share a disproportionate amount of poverty in Minnesota as well. The poverty rate amongst communities of color in Minneapolis that are over 50% for the African American and American Indian communities, and over 40% for the Latino community whereas their white neighbors see a poverty race of around 10%. Further, poverty’s worst impact is on children. Children of color represent 95% of the 176,000 Minnesota children living in poverty today. Additionally these students tend to live in communities that experience a greater impact from predatory lending, higher rates of unemployment, disproportionate levels of problems related to health and wellness, higher rates of violence and an education system that fails them. Students of color in communities across Minnesota and the United States also are sold out by an education system of school-to-prison pipeline as the result of disproportionate punishments wielded against students of color relative to their white peers. Rather than being a part of the solution to these social plagues in American society the University of Minnesota has mirrored the inequalities and injustice of it. In addition to underrepresentation of students of color, the University also has fewer faculty of color, has fewer tenure professor tracks in ethnic studies departments and routinely criminalizes people of color with racist crime alerts that spread fear amongst students and the community of the peers of color. The University administration released a statement Monday that it has a belief in “frank conversations” about the “issues that affect the campus community,” but it has consistently balked at the opportunities to do so. The opportunities to have such dialogue have always existed but neither President Kaler nor the Board of Regents has ever been interested in anything but discussing such matters on their terms in one-sided scripted speeches and behind closed doors, meeting in lavish administrators’ offices. This has maintained a status quo of talking without listening and words without actions that has served the University’s administration and bottom line of dollars over students well. If administration had decided to act upon its “beliefs,” then Monday’s protest would have never been necessary. That said, it is necessary and important that students stand up and fight for justice because the University of Minnesota and its administration certainly will not. If the U is going to be a center for democracy, education, progress, and transformation, it will be because students have fought for and won it, not because administration has talked about or mandated it as policy. Whose Diversity and others have both recently and historically challenged the University’s narratives about equity and diversity on campus including challenging the white-washing of the only inclusive safe spaces for diversity at the student cultural centers in Coffman Memorial Union. They have demanded a more inclusive, tolerant, and accessible campus and education for students in Minnesota, especially students of color. They have called for a more diverse faculty and more tenure tracks for ethnic study departments like Chicano Studies that now faces elimination by the university altogether, only further marginalizing an already oppressed group of students (additionally the University has remained hostile to Latino and Chicano students with racist publications producing images and documents perpetuating hostile and harmful stereotypes of Chicano and Latino student culture). Like those that have come before, Whose Diversity is on the correct side of history, the side that has demanded justice and tolerance, action and progress. Their demands echo the unfulfilled demands of the 1969 Morrill Hall takeover reminding us all that protests like these matter and they result in meaningful gains for students and the community, gains like the African American and African Studies Department and the Chicano Studies department. These victories, this history of struggle, explain precisely why such dialogue threatens the University administration, because it has the ability to undermine authority and empower students to act. The urgent tasks before us will not be easily concluded or quickly accomplished. This dialogue and the changes necessary are too important to be kept behind closed doors in lavish administrators’ offices. These struggles may take every year of our college careers to wage and mean passing the struggle on to the next generation of student in order to achieve meaningful changes and victories. Any successful dialogue undertaken must be inclusive for our whole community and must result in nothing less than action. If the university community wants change, the administration has demonstrated that we as students must fight for it. Students must lead the dialogue and follow through with the actions necessary!